When I was a little girl, I use to spend weeks at a time on my grandparents’ farm in Tennessee. I would go and stay, and then wail when my mom would come up to take me home. As a kid, it was my favorite place. My grandparents would drop everything when I would get there. And we would play outside, ride four-wheelers, ride horses, go fishing. It was always perfect. Fast-forward twenty-something years, and the farm still holds a special place in my heart. But getting to spend time up here is scarce. So I was super excited to get a stop-over here on our way to Nashville. Who wouldn’t want to wake up here? Have coffee on the front porch? Couple minutes of journaling? Quiet time? My Papaw’s been gone several years now. But whenever I’m up here sitting on the porch, I still feel like he is around. Watching over us. Quietly participating by keeping this place so beautiful. But visiting the farm always makes it a little better. Bittersweet. But a little better. This place feels more like home than anywhere else. So many memories. I’m so grateful to remember. Every September we advocate for Childhood Cancer Awareness. We need a cure. This child deserves a cure. All the children deserve a cure. And we will fight to get one. This month I will donating all of the income from my Beautycounter business to the American Childhood Cancer Organization of Arkansas in honor of Bit’s fight. Beautycounter and fighting childhood cancer go hand-in-hand. The mission of Beautycounter is to get safer skin care and beauty products into the hands of everyone. Some of the things found in our personal care products are known carcinogens, meaning they are known to cause cancer. With skin being the largest organ of our bodies, it seems like a no-brainer to want to take care of it. But here’s the thing…there is little to no regulation on what companies can put or not put into your personal care and beauty products. Words like “fragrance” are used to hide whatever carcinogens, hormone disruptors or irritants companies need to hide. We deserve better than that as consumers. Finding Beautycounter was a total turning point for me. Learning I could make better choices about what I put on my face and body makes me happy, and the products are high performing and high quality. My goal for September is to get safer products for you so I can donate my commissions to an organization that is near and dear to my heart. To get yourself some Beautycounter products, check out my Website. I will be giving away some really awesome stuff throughout the month. So be sure to watch for it on my Facebook page. It’s 10:47 p.m. and I’ve just finished prepping breakfast and lunch for tomorrow. The boyfriend and I are starting the Whole30. It’s time for a food check-up, and this is one way I feel like we can both reset our bodies. I’m not a fan of fad diets, or diets at all. But sometimes it’s necessary to simplify. We’ve both been slim our whole lives, but our late-twenties and early-thirties metabolisms are making our pants a little tighter and brains a little foggier. 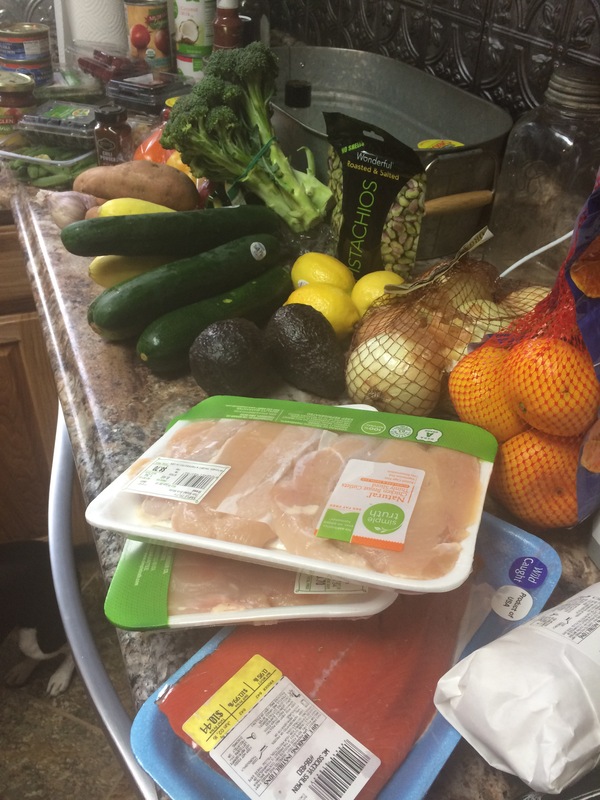 I went to the store tonight with the Whole30 book, and I got all the stuff to get us started. There’s a very real possibility we both will be starving by the end of the day. But after a couple of days, I think I’ll get this meal prep down. I just have to get us to the weekend where I can really think about food. But I have to go to bed so I will get up to drink my creamless coffee. And I have to leave a note on the door for the boyfriend so he doesn’t leave his breakfast and lunch at home. Otherwise, his first day of Whole30 could be harder than it has to be. 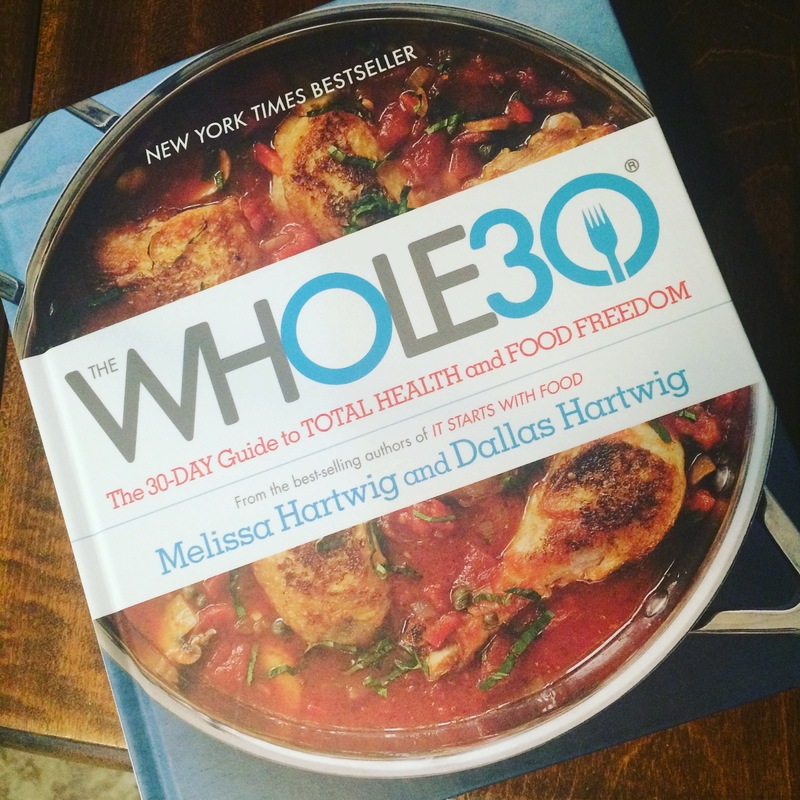 Follow along day-by-day to see how I navigate the Whole30. Here’s to a happier and healthier 30 days of June. And that beach body of my dreams. I have the best Boyfriend. He’s pretty cool. Some nights when I don’t feel like cooking or I’ve had a stressful day, he handles dinner. I typically do most of the cooking. The Boyfriend usually helps me grill stuff. But I’m the one who usually prepares everything. Last night, he totally came through for me. I had worked late, drove my hour commute home, fed the dogs and poured a glass of wine when he told me he was taking care of dinner. I would usually help him prep stuff. But last night, I didn’t have it in me. All my leftover energy went to lifting the win glass to my mouth and back down. I mean really. He is the holy grail of men. He puts this plate in front of me 45 minutes later. 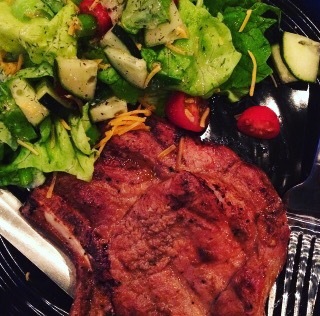 Grilled Barbecue Pork Chops with a side salad. I’d give you the recipe, but I have no idea what he put on the chops besides homemade barbecue sauce. He cut up the tomatoes and cucumber and lettuce for the salad. He thought of everything, even the knife, fork and napkin. As much as I enjoy cooking and creating delicious food for other people, I felt so special to have him prepare a meal for me. It’s simple, sweet gestures like making dinner when I’d rather not that make him the ultimate. Who made you a meal that made you feel “taken care of?” What did they make for you?